Caring Times September 2018 Cover Stars! 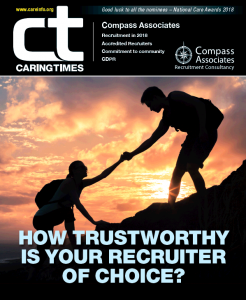 Compass Associates are featured in the care industry’s leading publication, Caring Times September 2018 issue. September is traditionally the recruitment edition, focussing their articles on all aspects of recruitment and staff retention within the care sector. 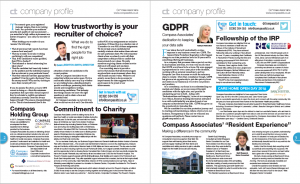 In this edition, Director of Healthcare, Sam Leighton-Smith discusses the trustworthiness of recruiters and how we differ from our competitors. Kate Fairbrother, Director of HR & Communications also discusses the hot topic of the GDPR and our commitment to data privacy. She also talks about our latest accreditations with our representative body, the IRP (Institute of Recruitment Professionals). You can also find out about our dedication to good causes with an update on our charitable exploits throughout 2018 and our continued support of Care Home Open Day. You can also learn more about what happened when Managing Consultant, Gareth Guyll and Senior Consultant, Matt Sheppard were invited to a “resident experience” with Oakland Care. For more information, contact Lily Parke, Head of Marketing: info@compassltd.co.uk. You can read the online version of Caring Times here.